In recent years under Amar Jesani the Indian Journal of Medical Ethics has emerged as one of the few venues willing to engage with pressing bioethical issues without fear of whether pharmaceutical companies or governments might be offended. Amar approached me a week ago to comment on the Goetzsche Affair. I borrowed a phrase invented by Tim Moss – Evidence Debased Medicine – for the purpose. A PDF of the article complete with references can be accessed Here. The body of the article is below. The first articles by Iain Chalmers announcing the Cochrane Collaboration appeared in 1992 (1), whose mission would be to systematically review medical evidence with a view to producing the best quality and trustworthy evidence (2). Writing The Antidepressant Era in 1995, I characterised systematic reviews as a logical, and necessary medical development (3). Although the founders came from Canada (Sackett and Enkin), the United States (Dickersin), Denmark (Gøtzsche) and elsewhere, from the mid-1990s, the United Kingdom (UK) became the home of the Collaboration. The idea of embodying Evidence Based Medicine (EBM) in Guidelines also took shape at this time. In Britain, in 1997, a Labour government created a National Institute for Clinical Excellence (NICE) which began issuing Guidelines underpinned by Cochrane methods and in some instances with Cochrane collaboration. The NICE process was and still is highly regarded, sufficiently so for the Labour government to issue a new plan for Britain’s National Health Service (NHS) that on the basis of newly-minted standards of care set about standardising the health service in a manner that embraces continuity of data, with an interchangeability of personnel, rather than continuity of care (4). In 2004, a world no-one anticipated came into view. As part of an FDA review of paediatric antidepressant trials at this point, it became clear that all trials in paediatric depression were negative, that all published studies were ghost or company written, in all cases the data were inaccessible and in the case of the published studies the publications were at odds with the data regulators revealed. The data on both benefits and harms was systematically distorted in publications even in the leading medical journals (5). This came to a head over the issue of suicide in 2004, when New York State filed a fraud action against GlaxoSmithKline (GSK), primarily on the basis that a ghost-written publication of Study 3291 claimed paroxetine worked for and was safe for children who were depressed, when in an internal review it had recognised it didn’t work and had opted to pick out the good bits of this study and publish them (6). This led reviewers within NICE, then compiling Guidelines for the treatment of paediatric depression, to publish an editorial “Depressing research” which raised a question as to whether it was possible in the circumstances revealed by these trials to undertake systematic reviews or write guidelines (7). The issue of lack of access to the data and ghost writing of publications was therefore “known” within the Cochrane collaboration and Guideline apparatus as of 2004. This is not a feature of paediatric antidepressant trials alone, as what had been revealed appears to be standard industry operating mode (8). Cochrane, NICE, and other guideline bodies, however, suppressed this awareness. Peter Gøtzsche, and later Tom Jefferson, have been the exceptions to this rule. Beginning in 2009, Gøtzsche began to lobby the European ombudsman for access to clinical trial data, and put the issue of access to data on the map. Jefferson, with others, chased missing studies on Tamiflu and as studies came to light he and colleagues progressively revealed a picture of vanishing efficacy for this drug (9). This process has led both Gøtzsche and Jefferson to encourage Cochrane reviewers to work from internal company Clinical Study Reports (CSRs), in addition to publications, and, latterly, as the issue of treatment related harms has become more salient, to question whether reviews are possible without the data. Their efforts have received support from many, but not all, their colleagues. Faced with stonewalling by regulators, the guideline apparatus, mainstream medicine, journals, and very little support, it has taken distinct personal qualities on the part of both Gøtzsche and Jefferson to pursue this course. Both men have called things as they are when others have been unwilling to do so. In the case of Gøtzsche, these personal qualities, shared with others among the renegade element present from the start, appear to have provided a basis for Cochrane to expel him in October 2018. In 2012, the Cochrane Collaboration dropped the word Collaboration and became a more managed entity concerned with its brand – Cochrane™. As a director of a Cochrane centre and a Cochrane council member, Gøtzsche came into regular contact with the new management. His forthright manner alienated some of the organisation’s management. Allied to this, from 2012 onwards Gøtzsche had increasingly called attention to the hazards of antidepressants (10) and several weeks before the board meeting that led to his expulsion, Gøtzsche and Jefferson had publicly branded a Cochrane review of HPV vaccines as untrustworthy and as a betrayal of Cochrane’s core mission (11). This provoked a crisis. 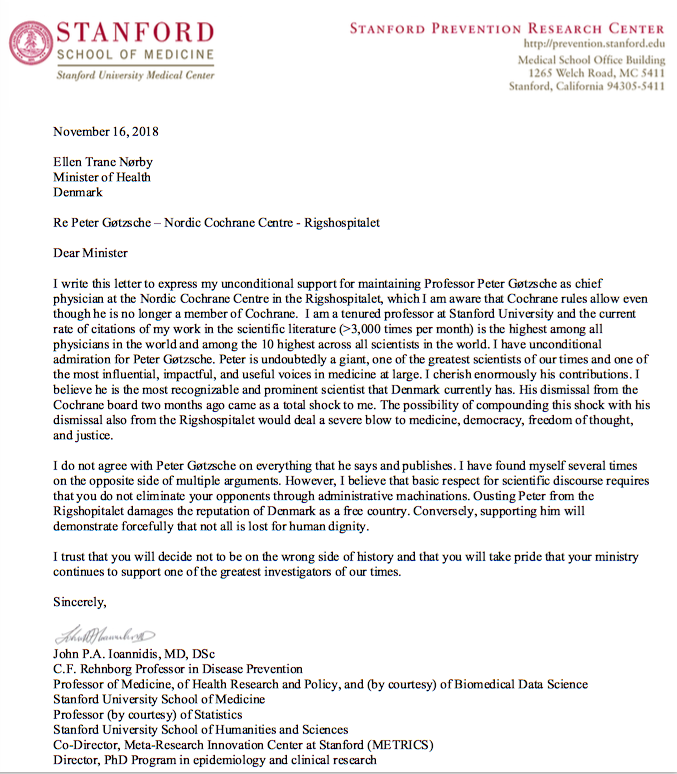 Cochrane board members split over Gøtzsche’s expulsion. Almost half the board resigned. A large number of Cochrane centres around the world wrote expressing their support for Gøtzsche. Cochrane centres are not funded by Cochrane™. They generate their own funds from national or provincial governments or other sources. This gives the directors of these centres a certain independence. For directors, however, the calculations as to what to do are not simple in all cases. Centre directors have “mouths to feed”. While supporting Gøtzsche might not initially lead to difficulties, some directors appear to believe that it opens them up to being pushed aside if another group sets up in their area and attracts the funding on the basis of an affiliation with the central organisation. Cochrane and its directors face a crisis. Every decision has consequences. In 2016, Jeremy Hunt, Britain’s then Minister of Health, stated that children’s mental health was the greatest point of failure of the NHS (12). As of 2016, senior personnel in NICE had a de facto policy of not sharing a platform with anyone who might state that their Guidelines were based on ghost written articles and were prepared without access to the data that outside observers in general assume underpin them. In 2018, children and their apparently deteriorating mental health was a regular and prominent feature in North American and European news features. BBC ran a primetime flagship television programme (13) and radio programme (14) on the issue of children’s mental health and the use of antidepressant medicines. Both programmes were briefed on the contents of an article then in press (15), which outlined that as of 2018, it appears that every single one of the 30 RCTs of antidepressants undertaken in childhood depression, involving over 10,000 children, have been negative on their primary outcome measures, and all appear to show an excess of suicidal events on active treatment compared to placebo. Both programmes were made aware of data from the Centers for Disease Control (CDC) that despite the results of these studies, antidepressants now appear to be the most commonly used drugs by teenage girls except for oral contraceptives (16). Both programmes were told that Prozac (fluoxetine) had been licensed for use in paediatric depression by American and European regulators in 2001 on the back of two negative trials. The licensing took place before concerns about pediatric antidepressants became widely known in 2004. From 2004 onwards, regulators and guideline bodies have continued to state that the pediatric fluoxetine trials are positive, when in fact on their primary outcome measures they are negative and as with other treatments there is an of suicidal acts on fluoxetine compared to placebo – in one trial 34 suicidal acts on fluoxetine compared to three on placebo but these data are effectively hidden (17). Both programmes balked at airing these issues. One (13) of the two made it clear that they had made enquiries of NICE in respect of the Prozac data and that NICE had refused to comment. As outlined above, there is nothing unusual about paediatric depression. The evidence in this domain is produced in the same way as in any other medical domain. As of 2018, the BMJ and other journals have carried several articles on falling or stalling life expectancies in several developed countries (18, 19). There is no generally accepted explanation for this. A possible contributing factor lies in the fact that more than 50% of people over the age of 45 in the USA are now on 3 or more medicines and more than 45% of over 65s are on 5 or more medicines (20). These data, allied to evidence that reducing medication burden to 5 medicines or less per day has the potential to reduce hospitalisation rates and extend life span, in addition to improving quality of life (21), suggest that poly-prescribing is having a detrimental effect on our overall health. The current figures for medication consumption are almost certainly driven by a hyping of the benefits of medicines and hiding of their harms in ghost-written articles accompanied by a lack of access to the data from studies undertaken. If this has a comparable effect on the health of the population in general as it appears to be having on children’s mental health, then the current crisis in Cochrane represents a watershed moment in modern medical history. While every director of a Cochrane centre has a responsibility to the mouths they have to feed, how can the Cochrane organisation justify tolerating 15 years’ worth of reviews based on ghost-written articles with a lack of access to trial data? Surely, this has been as deep a betrayal of the core Cochrane mission as it is possible to imagine. A petition against the dismissal of Peter Goetzsche can be found HERE. The Nuts and Bolts of the Vice-Like-Grip the entire Propaganda Machine has on Evidence Debased Medicine Networking. It goes beyond anything resembling Data Based Medicine. With all the proof in the world pointing to drugs like Seroxat, for instance; when the recorded proof of this drug and its catalogue of harms have been known about for decades and the stifled voices of thousands of youngsters and oldsters, many, many lives have been lost in horrific circumstances. Is the truth so unpalatable? It’s not just a British problem, although we can be justifiably ashamed that it is a British Company fighting their reputation and their drug tooth and nail. The media and the regulators sitting on a Time-Bomb too wary to light the wick? When everybody knows what is going on but the relentless campaign to cover it up is an International Problem, how profoundly does it reflect that this article is published in India. 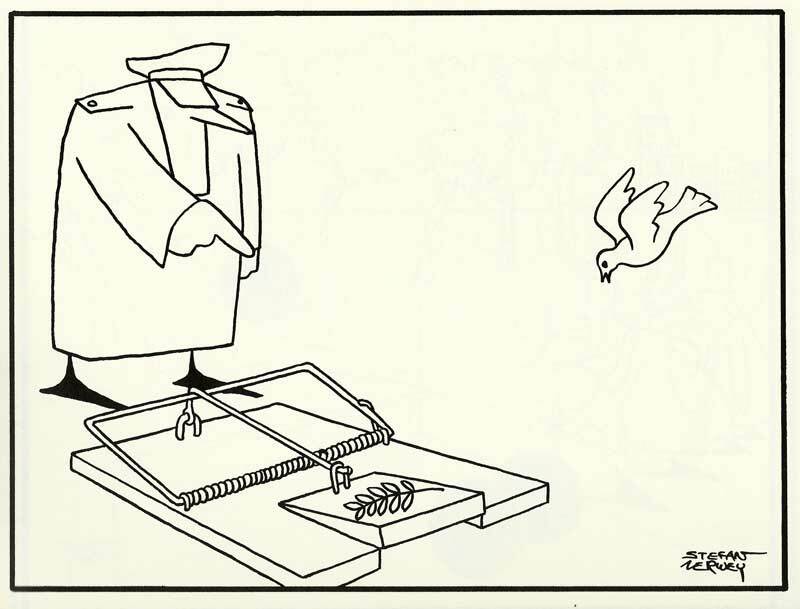 At least we know where we stand, as illustrated by Stefan Verwey. There are an incredible number of back-stories going on in the UK by people determined that these matters are kept under wraps, in perpetuity. Thank you very much David – the PDF is especially useful as I can use use it to forward to such as the AM for Mountain Ash (and others) which featured in a previous blog as having one of the highest prescribing rated in UK . Mountain Ash by the way is surrounded by the beautiful countryside of the brecon beacons where healthy people flock to enjoy themselves -and the valley towns – which sickenly have been described by an A and E consultant as being positively medieval with regard to provision of health services and quality of life. .Having ‘mouths to feed ‘ can never trump the cover up of corruption in Cochrane. So many people no longer have lives to live because of them. Surely there should be legal action taken now – surely there should be a petition to call for the resignations of more than just the trustees? Even if Peter G and others want to be reinstated is it likely they will be ableto change things enough that Cochrane could be trusted again? His name has been dragged through the mud shamefully – he used to be a much admired advocate of truth and integrity not just in medicine but courses on social sciences in the 80s. Mis -Using his name has led to so much harm and deaths – the complete undermining of all he stood for . John – I keep trying to find a politician with a conscience but recently had the usual brush off from Vikki Howells AM for Mountain Ash where the highest rate of psychiatric prescriptions in Wales are prescribed – sent her David’s article in the Indian Journal of Medical Ethics – I wouldn’t waste my time with the UK j of med ethics . AMs and PMs as you know always use the same cop out – you need to be a resident of their own constituency. Utter nonsense. Also used by MP Sarah Woollaston even if contacted as chair of health committee house of commons not constituency MP – she is of course married to Adrian James registrar of college of psychs. If the day ever comes that these people are held to account they can’t claim they didn.’t know. Adrian J gave an interview on BBC World News a few nights ago which included only a few people who promoted their need to take drugs based on their own experience – there was no mention at all of the side effects or inclusion of those who have come off them .Adrian gave a very soft interview stating that individuals make their own decisions whether to take them but if they decide to stop – his last sentence was consult their GP. as there a high likelihood of relapse. GP not psychiatrist? How counter productive that advice can be.No information about groups which could be contacted for further information was given as is usually the case in these programmes. The contributors were obviously chosen carefully by the college with collaboration of the bbc.once again. David, what was it that led up to the events in 2004, surely it must’ve been more than one single court case? What prompted FDA to do their review? Or perhaps my question is more of ‘what got the ball rolling’? I expect whatever it was to be heavily resisted by the manufacturers, but it still got undertaken, and obviously unveiled alot of controversial knowledge. Why then? Why around 2004, since the majority of SSRI had been on the market for over a decade? Is there a “triggerpoint” that was inadvertantly tripped? I’m sure something like this must’ve been foregone with alot of whispering in the corridors of academia. Just like I’m sure the technicians at car manufacturers were whispering about the manipulation of data regarding emissions…. I really ‘dislike’ how so many doctors and academics go along and accept faults at the very basics of the scientific body they rely on!! In regards to the Cochrane HPV vaccine review being publicly branded “as untrustworthy and as a betrayal of Cochrane’s core mission”, what about the issue of the Centers for Disease Control and Prevention’s Dr Lauri Markowitz being involved in the conception of the Cochrane HPV vaccine systematic review, development and writing of the protocol, critical review of the manuscript, and her provision of “invaluable advice and contributions by reviewing the results and discussion sections”? Lauri Markowitz has been involved in the promotion of HPV vaccination since its implementation in the United States and globally. It is totally inappropriate that a person involved with promoting HPV vaccination also be involved in a supposedly ‘unbiased’ Cochrane review of HPV vaccination. I have raised this issue repeatedly with Dr David Tovey, Editor in Chief of The Cochrane library, and repeatedly been given the brush-off. Markowitz has now withdrawn as an author of the Cochrane HPV vaccine review. How does this work when she has obviously had major input, demonstrably more than another listed author, i.e. Pierre PL Martin-Hirsch, who was only involved with the conception of the systematic review and critical review of the manuscript? Does Markowitz’ withdrawal as an author mean she is not accountable for the accuracy and integrity of the Cochrane HPV vaccine review, a criteria for authors recommended by The International Committee of Medical Journal Editors (ICMJE)? Markowitz’ employment by the Centers for Disease Control and Prevention and her role in promoting HPV vaccination are not disclosed in the Cochrane HPV vaccine review. It’s a serious matter that Lauri Markowitz’ conflicts of interest are not disclosed. Lauri Markowitz was involved throughout the Cochrane HPV vaccine review process. I suggest what the ICMJE describes as ‘a reasonable reader' would want to know about Lauri Markowitz’ associations and conflicts of interest. Why has the CDC’s involvement in the Cochrane HPV vaccine review via its employee Lauri Markowitz been camouflaged? Mere members of the public raising such matters are treated with contempt when they try to question the ‘peer-reviewed literature’ industry that promotes the use of vaccine products, whether this be via journals or Cochrane. This situation is particularly sinister with vaccine products increasingly being mandated by some governments, e.g. in the United States and Australia, on the back of industry-associated data being published in journals, and vaccine products being approved by industry-funded ‘regulators’. These vaccine products are being pressed upon us by conflicted government vaccination bureaucracies and industry-educated doctors. Cochrane was expected to be an impartial judge of material backing vaccine products, but via its demonstrably biased Cochrane HPV vaccine review, Cochrane has shown it cannot be trusted. In November 2015 Cochrane announced cessation of operations of its Cochrane Vaccines Field due to an ‘ongoing lack of resource capacity', so it appears there won’t even be the pretence of independently evaluating vaccine products in future, the international community will be left open to exploitation by the unfettered vaccine industry, and rampant ‘poly-vaccination’. This whole system is rotten to the core, it’s time for accountability. 1. Jørgensen L, Gøtzsche PC, Jefferson T. The Cochrane HPV vaccine review was incomplete and ignored important evidence of bias. BMJ Evid Based Med. 2018 Oct;23(5):165-8. doi: 10.1136/bmjebm-2018-111012. Epub 2018 Jul 27. 8. ICMJE Uniform Disclosure Form for Potential Conflicts of Interest. I write you as both Prime Minister and as a father of three young children to request your immediate intervention to enforce Vanessa’s Law in Canada. In 2001, GlaxoSmithKline’s Study 329 reported that its antidepressant blockbuster Paxil was safe and effective in adolescents with depression. But Study 329 was later debunked using clinical trial data — too late for many teens, including 18-year-old Sara Carlin of Oakville, Ont., who hanged herself after abruptly stopping Paxil, never knowing that 10.5 per cent of adolescent patients on Paxil had dropped out of a clinical drug trial because of serious psychiatric events, including suicidal ideation. Fifteen-year-old Vanessa Young of Oakville, Ont., died of a heart attack on March 19, 2000, after taking the prescription drug Prepulsid. Her father, Terence Young, established Drug Safety Canada in 2001 and has advocated for regulatory reform since. He was elected to Parliament in 2008 and galvanized both houses to pass Vanessa’s Law in 2014. It still has no regulations to empower key sections of the bill, four years after it received Royal Assent. *Integrity. – We are honest and share what we see. We listen to our partners, but remain independent. *Excellence. – We are a learning organisation, committed to achieving high standards. *Collaboration. – We work with others to support safe, high-quality care. * Fairness. – We respect people and treat them without prejudice. *Transparency. – We are open and account for our actions. “These values form the basis on which we operate. We want every decision we make, every interaction we have, and every email we write to embody these values. We regularly evaluate how we think we are living up to these values, and seek the views of others on how they think we are doing”. was the greatest point of failure in the NHS. As of 2016, senior personnel in NICE had a de facto policy of not sharing a platform with anyone who might state that their guidelines were based on ghost written articles and were prepared without access to the data that outside observers in general assume underpin them”. Medical Practitioners who write guidelines are registered with the GMC, and are obliged to follow the GMC’s professional standards, values, guidance and ethical values. “Integrity, Excellence, Collaboration, Fairness, and Transparency”? How is the continued advocacy for such evidence debased guidelines compatible with the GMC’s Core Organisational Values? ​Peter Gøtzsche has been suspended by Rigshospitalet until further notice. Rigshospitalet has appointed Karsten Juhl Jørgensen as acting head of the Nordic Cochrane Centre until further notice. The University of Copenhagen has been asked to take charge of supervision of the PhD students until further notice. “Today, I’ve asked all employees and students at the Nordic Cochrane Centre to continue their work as normally as possible during this difficult time,” said Per Jørgensen, Deputy Chief Executive at Rigshospitalet. “We’re striving to ensure that the Nordic Cochrane Centre continues as part of the international Cochrane Collaboration,” concluded Per Jørgensen. I assume, that the present situation regarding vaccines and psychiatric drugs, is as it is due to a wish from the powers at be. I assume that it is not only due to greedy corporations and their economical influence. I assume that the situation is based upon a wish from the powers behind the puppets called politicians. But how it in reality is going on i have a hard time figuring out. Maybe sociologists and others could come with a more down to earth explanation. My fear is, that psychiatry in its present and future form is and will be further used as a tool of projecting a political climate and system that humans actually oppose. ‘he discusses his expulsion from the debased collaboration’. Gøtzsche says he was informed last week that he was being suspended. “The only reason that they gave was that they no longer had confidence in my leadership,” he told Science. He says he is working with a lawyer to challenge the move. Over 4500 signatures of support and over 1000 personal comments. David Healy has written what could be the final epitaph of this sad and sad episode: the destruction of Peter Gøtzsche puts the world public health at risk. It’s time for more insiders like Gotzsche to break this conspiracy of silence by standing up for the fact that this is not now, and never has been, okay. “Professor Peter C. Gotzsche is fastidious and gifted in the identification of the malfeasance and manipulation of ghost-written, industry sponsored, manipulated clinical trials. His courage, determination and dedication provide an example to our profession. His continued, dedicated work within Cochrane is essential to improve the safety of the public, and to protect all patients from serious and life-threatening, common Adverse Drug Reactions . ADRs so often denied, misdiagnosed, and causing great suffering on a population scale”. The potential Cochrane disintegration is symptomatic of a profession that appears to have widely abandoned the basic tenets of ethical medical practice in favour of greed and pomposity. Where self, and guild importance now takes precedence over our primary raison d’être. That is – (or used to be) – dedication to strive for excellence in the care of each and every individual patient. Those who may conspire to try to silence diligent researchers like P.C.G. risk exposing less than altruistic motives, whilst motivating thousands of us to challenge a perception that marketing “The Cochrane Brand” is a higher priority than scientific integrity and/or the patient safety and quality care. This would amount to blatant abandonment of “Primum Non Nocere”. No doubt those who are intolerant of Peter’s modus operandi will be in receipt of praise and endorsement by the “Republican Guard” of the mainstream psychiatric establishment, as well as from those who’s dedication is apparently to pharmaceutical marketing and/or where loyalty lies with major donors. Attempts to damage, even destroy, those who speak truth to power simultaneously damages care and compassion for patients. Marketing masquerading as medicine causes further injuries to those whom psychiatry has made into “patients” via the over-zealous, coerced and enforced use of some of the most toxic drugs ever misused on human beings. We all have a duty of care to those few who maintain the very highest ethical and professional standards regardless of the inevitable risk to themselves of organised persecution, intimidation and denigration. How blurry is the line between healing and killing? The doctor-patient relationship is often revered as an exemplar of trust and openness. But with the medical profession’s intrinsic relationship with the pharmaceutical industry, many doctors are knowingly or unknowingly being converted into industry sales representatives. How have these links lead to the pathologising and overmedication of patients, and are our trusted healers doing more harm than healing? Oksana is joined by Dr Peter Gotzsche, the Director of the Nordic Cochrane Centre, to examine these issues. HPV vaccine: news management vs. public safety and the right to know? To an earlier generation of journalists the split in Cochrane  and the attack on HPV vaccine safety by senior scientists [1,4] would be attention grabbing headlines, and rightly so. As it is, can health professionals – if they have managed to inform themselves adequately – properly tell their patients that these products are “safe” or even that “the benefits greatly outweigh the risks” (the usual rubric)? If the news media was not in breakdown everyone would be told, and not just those who have their noses buried in medical journals: ordinary citizens have a right to know – it affects them. Indeed, with this amount of justified doubt should not the products simply be withdrawn? If I had known what was in store for me, the title would have been “Death of a Whistleblower.” I describe the problems I have had with the leadership of the organisation I co-founded 25 years ago, the Cochrane Collaboration, particularly in relation to my criticism of psychiatric drugs. Back home in Denmark, my hospital announced that I would be fired, for no good reason. It seems to be a political firing coming from the Ministry of Health, which has paid no attention to the fact that I have saved Danish taxpayers billions of crowns though my research; have created a research centre of international repute; and that the patients appreciate my initiatives. Now the time had come to silence a vocal critic of the drug industry, psychiatry and the establishment. This is what his ‘shocked’ Doctor said about logic ..
To the logical Doctor suicidal thoughts did not equate with the act of suicide. To the logical Doctor increasing the medication equated with how he was going to get better. To the logical doctor attending his appointments and keen to engage meant the patient would not act on suicide. To the logical patient he told his doctor he had suicidal thoughts. To the logical patient the doctor increasing his medication would process his suicidal thoughts. To the logical patient attending his appointments and keen to engage would keep him alive. This logical doctor afforded this logical patient with emotional intelligence. “Oh my! What about suicide? After only two weeks, it had been seen by over 10,000 people from over 100 countries. Paradoxically their attempts to discredit Peter Gotzche has had the opposite effect. Thousands of people from all backgrounds and all partsof the world have shown their support for him , maybe there is some cause for hope there. And hopefully no more attacks or other bad news for Peter G who ended another video by saying he would soon be fighting the hardest battle of his life but didn’t expand on that. Meanwhile students, researchers are getting a terrible message – universities used to be places where thinking was encouraged now they are too often money grabbing institutions selling degrees. Cochrane students have been told their work will now be supervised by the university in Denmark. Maybe next move will be to set up ‘educational’ institutions such as in China to indoctrinate those who stray from the fold . . The funding could be more usefully spent to clear up the mess they have caused by mis use of drugs But not so much ‘fun’ to be had maybe . Did try to send an email to Tim D to ask for info regarding the 16.000 but no luck I do understand the brain is a mighty complex thing but if people are to be used for research and ‘treatments’ these details need to be available and described in a way we can all understand. including to clients and volunteers as part of informed consent. When no new posts emerge on Davids blog, I get my dose of “info” from youtube and other video sites. I’ve seen many talks and lectures, for being a non-academic. And Peter Goetszche is among those who strike me as very intelligent, but also clever enogh to deliver his message in a good way. Sympathetic person. Just as David Healy. Most often, when watching academics, those who are too eager to bring the conversation to an overly ‘intelligent’ level, fail to get their message through. And finding patterns in the way ‘company shills’ deliver their message is sometimes hilarious. I have almost become allergic to some of the reasoning they use. It is not just in medicine and pharmaceuticals, but in many other sciences aswell. So many refers to “scientific data” or “repeated RCT’s” or a “consensus in the scientific community”. So much hinges on the science to be flawless, when it rarely is. The latest video I saw had such a hard time describing the origin of DNA, since one side argued that one of the basic proteins in DNA could not replicate without DNA allready be present. Even I understand that the “chicken or the egg” had to have come first. Yet there was only one side in the debate who claimed to have the “scientific proof”. I think humans have an inherent difficulty to say “I just don’t know”!!! Day 66 #cochranesituation: which side of history are you on? I trust that you will decide not to be on the wrong side of history and that you will take pride that your ministry continues to support one of the greatest investigators of our times. No democratic debate on future strategy of Cochrane. No possibility to communicate with voters. Only central leadership controls census and voting process. No way of knowing what new board members will do. Opaque, deadened and centralized. 3. Acting as a Board member requires a collaborative approach to decisionmaking, setting aside personal opinions and group affiliations and acting in the best interests of the charity. Please describe how you would fulfil this obligation, using examples from previous committee or other work (maximum 200 words). One of Cochrane’s founders has been dismissed from the organisation’s board. His dismissal is symptomatic of deeper problems in evidence-based medicine. Editor-in-chief of The Journal of the Norwegian Medical Association. Let us hope that this is not what has failed in the recent events at Cochrane.